Over time I have accumulated an assortment of tools that work in my daily chore routine. The hand truck carries bags of feed, goose pens and Rubbermaid water troughs. The forks, hay-tines up and manure-tines down, move the hay from the round bales, to the feeders then eventually scrape the manure soaked leavings from the barn floor. After time spent cleaning stalls in a horse barn, I like the look of swept floors so the broom is put to daily use and the feed shovel scoops the sweepings for the chicken coop floor. The fish net transforms into a poultry net on the farmstead and is always handy when rearranging birds. 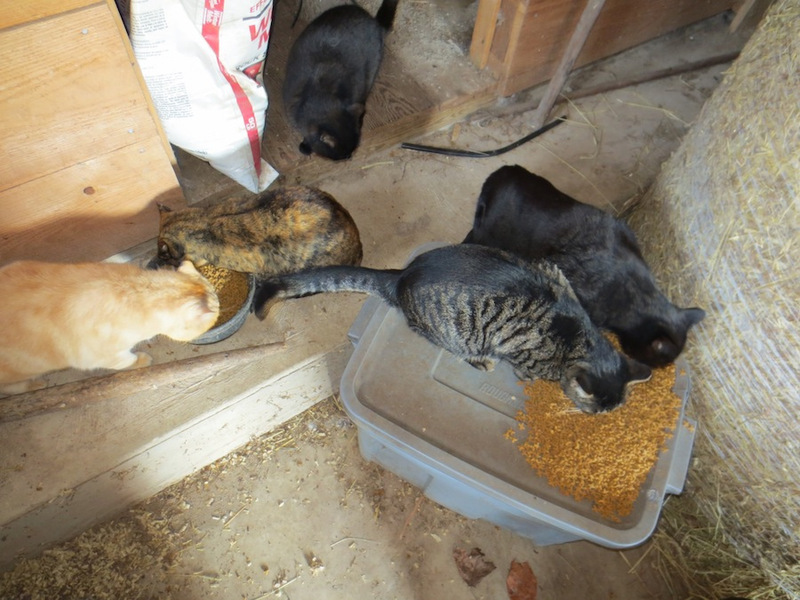 The mask keeps my lungs clear of all the dust.The nine barn cats keep our outbuildings free of rodents in spite of an outward appearance of lethargy. In the fall the felines add weight to their sleek frames and thick coats to protect against the winter weather.Once the weather chilled these lightweight Muck boots replaced my Dunlap rubber boots . When the temperature dips later this season, the heavy Mucks will be called into service.